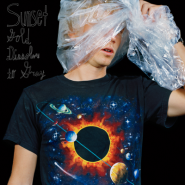 Sun­set, hail­ing from Austin, Texas, has been quite rapid­ly releas­ing albums, the newest of which is Gold Dis­solves to Gray. The band, prob­a­bly best described as “indie exper­i­men­tal folk-pop,” has with Gold Dis­solves to Gray pro­vid­ed a whirl­wind tour of the fur­thest pos­si­ble stretch­es of its genre, from a cov­er of the clas­sic, once-reg­gae, “Rivers of Baby­lon” to the more elec­tron­i­cal­ly-influ­enced “So Long Farewell Adieu.” Unfor­tu­nate­ly Gold Dis­solves to Gray, while cer­tain­ly not bad in the slight­est, is sim­ply nei­ther ter­ri­bly inter­est­ing nor any­thing incred­i­ble. Gold Dis­solves to Gray is, for the most part, just about mediocre. Gold Dis­solves to Gray opens with a pure­ly instru­men­tal track. High­ly promis­ing, it takes a sim­ple, catchy chord pro­gres­sion and maps it to an odd rhythm, with the final prod­uct being an inter­est­ing, active, and still very much acces­si­ble track. Unfor­tu­nate­ly, what fol­lows in its wake is noth­ing like the intro­duc­to­ry track. Even on “Green Truck,” which quite clear­ly harkens back to the first track, no inter­est­ing rhythms are to be found, and much of the activ­i­ty is lost. Oth­er tracks like “Fish­town” cer­tain­ly have their own mer­it - “Fish­town” with its infec­tious bass and airy vocals that some­how man­age to fit in with the rich instru­men­tals, as well as, say, “Gar­den of Eden” (instru­men­tals that are sim­ple, but nonethe­less tai­lor-made to fit the vocal style), and the instru­men­tal con­clu­sion of “Our Dreams Did Weave a Shade” (in the cre­ative descend­ing chords and an even more cre­ative echo­ing dual-line gui­tar solo that fol­lows). Still, it’s hard to shake the feel­ing that most of the album is not much more than a let­down. “Sun­shine Hair” opens with a poten­tial­ly inter­est­ing gui­tar line that then dis­solves into sta­t­ic noth­ing­ness, occa­sion­al­ly punc­tu­at­ed by strains of the orig­i­nal gui­tar line that some­how man­age to seep through the instru­men­tal smog. Addi­tion­al­ly, much of the lat­ter part of the album, espe­cial­ly from “Civ­il War” onwards, when not down­right dis­ap­point­ing, is sim­ply dull, and acts as lit­tle more than filler mate­r­i­al. Bill Baird’s vocals don’t enter Gold Dis­solves to Gray until after the first track of the album, “Change Comes Slow,” but once they do, they help to devel­op each of the dis­tinct styles that appear through­out the album. Slow­ly emerg­ing through “Sun­shine Hair,” where they serve as a some­what sub­dued pres­ence, into the famil­iar folk-styled cov­er of “Rivers of Baby­lon,” and final­ly into the hilar­i­ous “Gar­den of Eden,” where Baird uses his voice in a man­ner that most close­ly approach­es a rhyth­mic sort of spo­ken word, Baird’s voice opens the album, intro­duc­ing the vari­ety of influ­ences found through­out Gold Dis­solves to Gray. Gen­er­al­ly, the album works well vocal­ly, though mis­steps in mix­ing or over­all sound occa­sion­al­ly crop up. Gold Dis­solves to Gray begins rel­a­tive­ly well with the musi­cal­ly inter­est­ing “Change Comes Slow,” but quick­ly begins the fluc­tu­a­tion in qual­i­ty that plagues the album. The inno­va­tion of the first track is nev­er seen again, and though sev­er­al tracks (includ­ing “Gar­den of Eden” and “Hill Coun­try Smog”) are inter­est­ing sim­ply due to their lyrics, the album becomes regret­tably stag­nant sur­pris­ing­ly quick­ly. Gold Dis­solves to Gray is most­ly sol­id musi­cal­ly, but it’s sim­ply not inter­est­ing enough to sus­tain itself through its entire length.